While we were off roading in Harlan, Ky this weekend we met some very interesting other people on the trails. It was interesting to see how their beliefs about what they were capable of effected their results. On the Mason Jar trail we met three different groups. The first group we encountered had very nicely built rigs. They all had bead lock wheels and very large tires. They all had exo cages and big axles. We expected them to easily run up the trail that we had run before in our XJs. However, they seemed to have lots of trouble. The first rig had an electrical failure before the first rock. The second one had a bit of trouble getting over the first few rock in the entrance but came to complete stop at the second set of rocks. We waited a long time to see how he got over. He was pulling winch line when we left but it did not seem like he was going to get over even with the winch. We left to try again the next morning. Based on what I saw there, I was a little worried about whether we could make it at all. But I was committed to giving it my best shot. Adam and Neal made it in just fine and after some work at finding the right line made it over the second set of rocks just fine. See the video of Neal here. 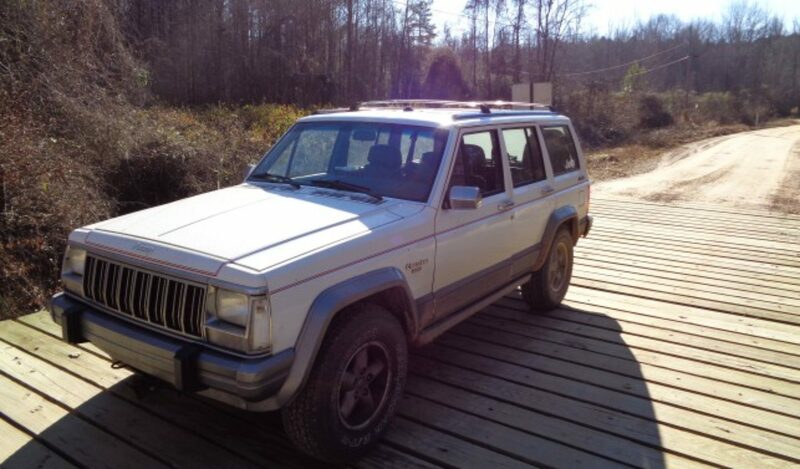 After seeing the XJs make it over, I once again believed I could do it also. I knew that I had expert spotting and caching from my friends. I also knew if all else failed, I had my winch. When I got to the second set of rocks that had stopped the buggy on 37 inch tires and bead locks, I trusted my spotters and after some maneuvering to get properly lined up, I was able to hope my Jeep right up on the rocks. My 33″ Buckshots scrambled for traction and then pulled the back of my Jeep right up the rock. Then I scooted up the muddy hill afterwards. My belief in my abilities grew quite a but after that climb. Another group that we met along the trail really impressed me. I don’t really know the best term to describe them. Lets just call them old codgers. These two Wranglers were piloted by some guys with some miles on them. One of them seemed to be a bit hard of hearing because when Neal told him he could go around us he laughed and said he though we called him a “gourd head.” They were each accompanied by a female of similar vintage in the passenger seat. What struck me was that they were sprinting up and down the rock as fast as the youngest and fittest of our group. They certainly had not limiting beliefs about their age. When it came time to watch them drive their their rigs, they really impressed me. They had no doubt at all that they could make the climb. They obviously had years of experience and made the climb look easy. They certainly were not ready for a rocking chair in a retirement home. They were playing and having a great time. I hope to be doing that when I get their age. Charles Filmore suggested that the way to stay young was to stop thinking old thoughts. I did not see any evidence of old thoughts among that group. Many times we limit our progress due to our beliefs. Today I am working on a proposal for a client that at fist I did not see anyway I could do. But after thinking about this weekend off road, I decided to think differently. I have emailed the client to see if there are options that will make it possible for me to fulfil his specs with the resources I have at hand. I am setting larger goals. I am doubting my limits instead of my abilities. I am moving forward to face even bigger obstacles.